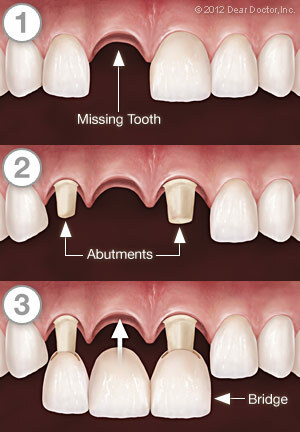 The number of abutment teeth necessary to replace missing teeth is influenced by the number of missing teeth, the size, and length of the abutment tooth roots, the amount of bone support each abutment tooth has, as well as where in the mouth the missing tooth is located. For example, if you have three missing teeth, four abutment teeth may be necessary, thereby creating a seven-tooth bridge. Engineering and designing of the bridge require an understanding of how to replace teeth, as well as the biology of the supporting gum and bone tissue. Do you want more information about bridges from Lee's Summit Family Dentistry? Call our Lee's Summit, MO office at (816) 554-7720 to learn more.